For lunch today, my dad, the kid, and I got takeout from Jake's deli. Jake's is in a formerly Jewish, now African American, neighborhood. Its regular clientele include the commissioner of Major League Baseball, whose picture hangs behind the counter, and the neighborhood artist Prophet William Blackmon. 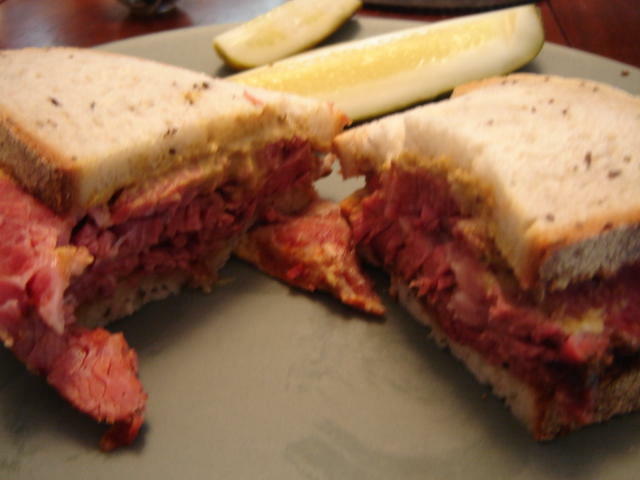 Some Jake's-lovers think their corned beef and pastrami is superior to that of the famous New York delis (Katz's, Carnegie, 2nd Ave.). I'm not connoisseur enough to say. I can tell you that the meat was steaming hot when it was hand sliced and that it made the car smell really good all the way home. The meat was delicious, pretty fatty, sliced thick, served on fresh rye (there's a mechanical slicer in plain sight) with yellow mustard. My dad and I got one corned beef and one pastrami and each had half of each sandwich. He thought the corned beef was of higher quality than the pastrami and I agree. The corned beef was more moist and flavorful, but both were fantastic. They serve excellent half-sour pickles, too. The deli itself is old, most of the lights weren't on, and no one was sitting at any of the tables. There's a charming soda fountain behind a counter with stools but it looked too clean, like it hasn't been used in a long while. This place is a bit too museumlike to be all fun. Its ambience is authentically nostalgic (as opposed to the sham nostalgia of Applebee's and Cracker Barrel) and that gives it a quality of melancholy. But the food at Jake's is the real deal.